Volunteers spend time on Mondays (except legal holidays) meditating on the Eucharist and praying for the parish and world. If you'd like to be placed on the schedule, contact Connie Berni. 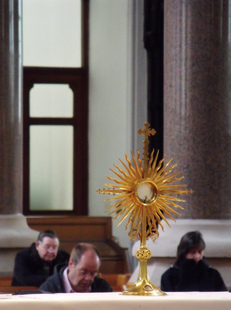 in to Eucharistic Adoration anytime Mondays from 8:30 a.m.–6:30 p.m.